Simon waited until my birthday in June 2012 to propose, just 11 months after first meeting. He took me down to Lake Ullswater, which is one of my favourite places. He made a picnic, which very unusually he didn’t eat much of ! and then got down on one knee and popped the question, it was perfect! Simon is from the Scottish Border town of Newcastleton but being in the army over the past few years has lived in Colchester and more recently Catterick. We both now call Penrith Home, with our little boy Joshua and dog Leo. 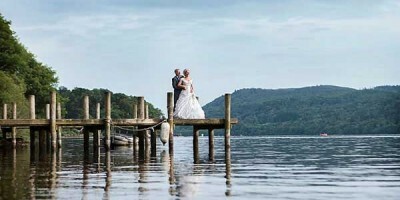 We agreed that Penrith would be the perfect place for us to get wed as it is where I have grown up and all my extended family live here or within close proximity. Simons Family were happy to travel the short distance from Newcastleton and so that was that. We choose St. Andrews Church in Penrith town centre to get married. The church is beautiful and having grown up going to school assemblies ect there it seemed perfect. The location is great and there was plenty of room for all our guests.We chose to have a more informal wedding breakfast. We hired Melmerby Village Hall and had a hog roast, it was everything we wanted and more. We decided to have a tea party theme to our wedding so we chose pastel colours when decorating the village hall with bunting ect. My bridesmaids wore silver dresses and the groomsmen had matching cravats. Simon, his best man and our little boy were in uniforms, which added something really special. We wanted to have a relaxed feel to the wedding and so kept seating and evening informal. We got engaged in June 2012 and shortly after had our little boy Joshua in the November and so I didn’t start looking for my dress until the March 2013. I visited two or three shops including the Wedding Warehouse, Carlisle. I took two of my bridesmaids and my mum with me. I thought I knew what I wanted but decided to try on a few different styles. My friend picked out a dress, which I wasn’t sure about and I tried it on first. I actually really liked it but I tried on another five, each time comparing them to the first dress. I ended up putting a deposit down on that dress and it became “The one”. My dress was ivory white lace with a train. It had a lace halter neck with diamonds around the neck line and waist band belt. I also had a long lace veil. Everyone had said that on your wedding day you feel like a million dollars and in this dress I really did…..
My family believed that I should have at least some of the above, my Gran bought me some new diamond earrings and my aunty sewed a small blue flower onto my garter. I wore my great aunts diamond ring, as my something old but I didn’t have anything borrowed. Tradition is important and I’m glad I was able to wear things my family had got me on our special day. I actually don’t have one individual photograph as a favourite. Steve captured every part of our day so well that I have fallen in love with them all, each tells its own story. All of our family and friends who have viewed them have said how beautiful they are! I spent a lot of time on pintrest getting ideas, but I wanted to make our day our own and tried not to focus too much on what everyone else has had and just take key ideas for each part of the day. Your wedding day is about your love for one another and your commitment to that. It is so easy to become wrapped up in place settings and what canapés to have on arrival and whether you have chosen the right wine for uncle Fred, that you can forget this. My advise would be remember what the meaning of your wedding day is! sit down with your partner and decide on key parts of the day together and take all the help you can get during the organising! but most of all Enjoy every minute because it will all be over so quickly! There is so many parts of the day that will stay with us forever, if I had to choose just one it would be walking down the isle on the arm of my dad past all of our family and friends looking at Si and just feeling amazing. Steve was professional from the minute we met him. He put us both at ease and discussed the best package for us. On the day Steve arrived at my mums to take pictures while I was getting ready, although having only met him twice before, I felt very comfortable with him taking pictures and at times we almost forgot he was there. He was brilliant at organising our family and friends ( I still cant believe how good with peoples names he was, especially having not met any of them before!) We were unlucky with the weather on our day, however Steve embraced this shooting off in his car in the rain to ensure we had the best possible pictures, where we wanted them. He has truly captured our day exactly as we wanted and I will be highly recommending him to anyone who asks.